1. 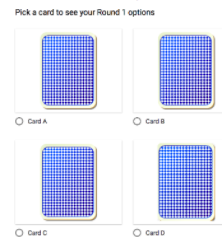 Every 2 weeks, Mrs. Lattari will send out an email with a Google form that contains the mystery cards for that round (incoming 5th Graders can access the form through the Google Drive folder shared with them). There will be 5 rounds total. Choose the card you’d like to reveal and press “Next”. You’ll be taken to another page that will tell you the category for that card. 3. You can stop there if you want and read a book that fits that category or you can go back and look at the other cards--it’s up to you. But you MUST read a book from 1 of those 4 cards for that round to count! Mrs. Lattari will include a suggested reading list for each round to help you choose a book to read. ​4. Once you’ve read a book for that round, color in the corresponding square on the game board and write in the book title and author in the corresponding spot on the top or bottom of the paper. A book can only count for 1 space so choose carefully! ​5. Filling in all 5 spots will get you to the finish line which means you can enter our back to school raffle in September! If you choose to read more than 5 books from the card categories, you can fill in the bonus spaces--make sure you mark the titles/authors down. You will get an extra raffle entry for each bonus book you read!